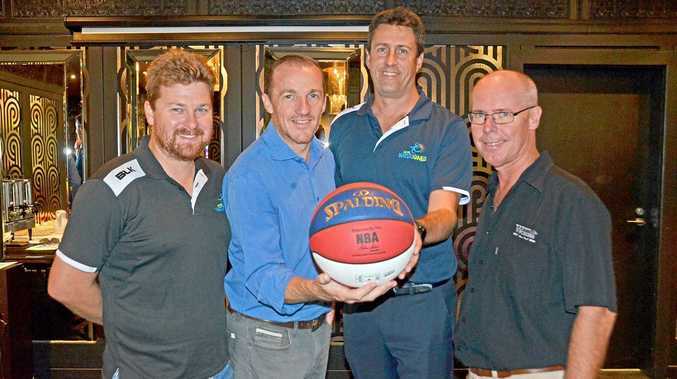 GAME ON: From left, Lismore City Council's Mitch Lowe, Lismore Mayor Isaac Smith, Masters Games chairman Matt Barlow and Lismore Workers Club president Ian Harmon launch the Masters Games 2019. THE countdown is on and entries are open for the biennial Lismore Workers Masters Games to be held from September 27-29. The event attracts more than 1500 people to Lismore to socialise, meet up with friends and enjoy three days of fun and fitness. Lismore City Council events officer Leanne Clark said the Games had become a major event on the town's calendar. "We absolutely love the Masters Games - the event is just so positive," Leanne said. "All our competitors love playing sport but the Masters Games is not all about winning. It's about taking part, hanging with your mates and enjoying the camaraderie that sport offers." Leanne said the 2019 Lismore Workers Masters Games would be extra special as they celebrate 20 years since the event, which is held every second year, was created. "We cannot believe this event has been going for two decades," she said. "Some of our youngest players when we started are now our senior Masters. "But that's how much people love the event - many have been coming since it started back in 1999. "We are also celebrating two decades of sponsorship by the Lismore Workers Club. "The club came on board as the naming rights sponsor right from our very first Games and has been a faithful partner ever since. We would like to thank them for their unwavering support of the Masters Games and our sporting community." The Masters Games, held across numerous Lismore sporting venues, offers 20 sports to choose from and a high-quality social program to entertain all competitors. Lismore City Council's tourism and events manager Mitch Lowe said the Masters Games also provided an important economic boost for the city, with around $1 million injected into the local economy. "In the past 20 years, the Lismore Workers Masters Games has gone from strength to strength and we have competitors flying in from right across Australia," Mitch said. He said there had been major upgrades to several sporting facilities over the past two years including Oakes Oval, Crozier Field, the Albert Park Baseball and Softball Complex and the regional hockey facility at Hepburn Park in Goonellabah in preparation for this year's event. Registrations are now open for the following 20 sports: baseball, basketball, cricket, equestrian, golf, hockey, lawn bowls, mountain biking, netball, Oztag, fitness challenge, football, five-a-side football, rugby union, softball, swimming, and Masters Mini Games (euchre, darts, pool and indoor bowls). To register for the eleventh Lismore Workers Masters Games, go to lismoremastersgames.com.au. Early bird registrations close on June 28.